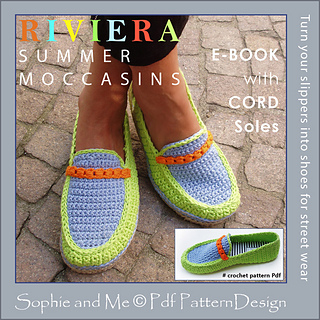 RIVIERA MOCCASINS - Crochet Slippers. Easy to wear, classic and comfy home shoes for all seasons. Worked toe to heel, in two pieces, with a final strap across the foot. 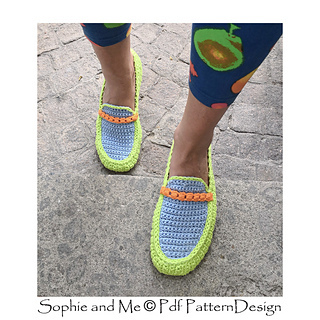 The moccasins looks great in one solid color, but are begging for color combos! At least three possibilities for different shades. Join outsoles to the bottoms. Protect you slippers and turn them into shoes for street wear. 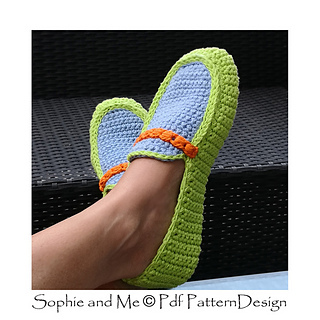 This sample has Flip-Flop Soles, see photos in end of page. 15 pages. 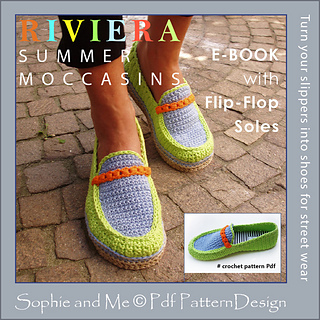 Written instructions, step-by-step pics, tutorials, and stitch diagrams for all sizes. DK/Worsted. Cotton, or any suitable yarn for this project, obtaining the gauge-info in pattern. My yarn: MAFIL (Italian brand), Cablè 3 (crochet-thread # 3), worked with two strands. Achieves a firm fabric. 50 g ball (1.8 oz), 140 m (152 yd). Substitute yarn: Eg: Aunt Lydias Crochet Thread #3. • WPI: Learn how to determine yarn weight. Total 75-125 g (2-4.5 oz) depending on size. EU 3,5 mm (US E/4), or any size to obtain gauge in pattern. 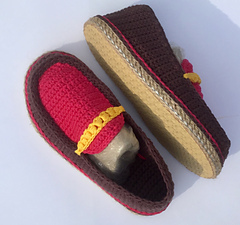 Protect your slippers from wear and tear, join outsoles to the bottoms. 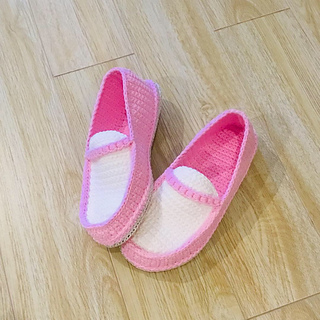 Outsoles will give sturdy non-skid slippers, and they will last for years. Insoles adds extra comfort and softness, and keeps the slippers in shape. Personalize the insoles with matching fabric and labels. 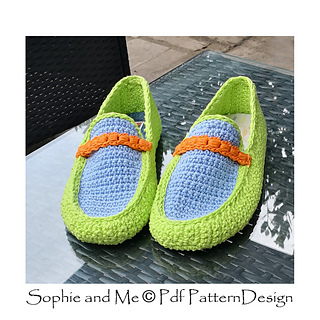 I offer customer support for my patterns, and welcome any questions you might have. By purchasing an item from my shop, you agree not to copy, distribute, share or resell the design, in print, or as a digital file.